"...the thrills and horrors are engrossing." "Vick's dark, tense thriller pits young kids--and their older selves--against a demonic evil and his twisted daughters in Upstate New York... Vick bounces the storyline between eras effectively, and the tension never lets up. Stephen King fans will enjoy spotting the references that Vick sprinkles throughout in homage..."
drive the plot of Demon King by Erik Henry Vick through intense action and psychological turmoil. Extremely well written, with clearly defined characters and steady action with surprising twists and turns, Demon King is a novel that is impossible to put down. Gripping and intense are only two words to describe the effect of the story, but if horror is your pleasure, that is all you need to hear. Erik Henry Vick is certainly an author to fill you with nightmares. Fabulous story. I loved it!" "Vick’s (Errant Gods, 2017, etc.) supernatural horror story is evocative of Stephen King’s work in its use of a small-town setting and a gang of friends facing a powerful evil." 5 out of 5 Demonic Stars for this one! "What do you get when you mix elements of fear, mystery, suspense, foreshadowing and a perfectly gripping plot? Give up? Well... if all of these elements are woven together in a seamless piece of writing, you will end up with one fantastic horror story! This is exactly the case with Erik Henry Vick's novel, Demon King. This is one intense book you will just not be able to put down as it will captivate, engross and horrify you from start to finish..."
"I really enjoyed this book, it is sufficiently scary and nail biting suspenseful! The characters are wonderfully written and beautifully evolved. Finally a truly scary story that had me held in it's grip from beginning to end! Most stories claim to be a horror story and fail to deliver that true sense of dread and fear. This story does will not disappoint horror genre fans. It was a griping nerve jangling tale that will chill you to the bone and yet have you coming back for more! A smart well written story that in my opinion makes this author one of the best writers out there. I recommend this book highly to anyone who can handle a griping, nerve rattling story with heart. Well done honestly I loved it!" "I read the first book in 36 sleep deprived hours and bought every book he has written that I could find.... If you like Stephen King, Robert McCammon, or Clive Barker then check out Erik Henry Vick, you won't regret it." The best horror story I've read in years! "Read the entire book in two days, couldn't put it down. Well written and Erik Henry Vick is one of the best writers today. READ THIS BOOK, you'll love it." This writer in my opinion is an amazing talent! "The characters and the plot were really good! I liked how he nods at Stephen King but keeps the story very much his own style. While reading this I was trying to figure out all the mysteries and clues to the very end and I wasn't disappointed when I reached the last page." Before you know it you're hooked. "Similar to early Stephen King! Loved the book! Gradually introduces the bizarre in a way that is acceptable. Before you know it you're hooked. I was pleasently surprised." Grab this one right now! "If you like a fast moving story with two time lines then grab this one right now!" "A combination of Stephen King and Dean Koontz. Awesome." Future of the horror book scene. "This author may just be the future of the horror book scene. I enjoyed everything about this book, give it a try you will not be disappointed." "Wow! This book sucked me in from the first pages and didn’t let me go until the very last page. Give me more! "Demon King" reminded me of Stephen King’s "It" in the back-and-forth, then-and-now story structure. Children are assailed by unknowable evil; then as adults, they must face it again, but without the benefit of the memory of their earlier experiences. Encounters with these vile creatures does some serious damage. Will they be able to pull the necessary courage and grit to survive and triumph? This guy has some serious story chops. 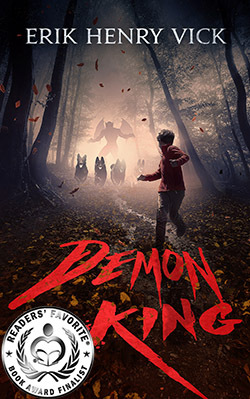 Demon King easily earned 5 stars from me! "It kept my interest all the way through. Although my days of reading a book a day are gone, I read this in 2 days." "Often a writer begins a story involving supernatural elements and it seems as if they feel compelled to justify those elements and dilute their impact. Not here." "If you are a fan of perfectly executed horror, then I would highly recommend this book!" Reminds me of Stephen king or dean koontz. "His writing reminds me of Stephen king or dean koontz. I hope there's a part 2 to this book very quick!" "I highly recommend this book. It was one of those books that you think about when you're not reading it, and then you're sorry to see it end because you've become so attached to the characters. What an amazing book and an amazing author. You will not be disappointed!" At the bottom of the hill stood a white clapboard house, dressed with peeling paint and creeping ivy. Dark windows gaped like missing teeth. Over twenty bikes teetered in an unstable heap amidst the mini-tornadoes of whirling fall leaves in the backyard. The pile held all kinds of different bikes: BMX, ten-speeds, bombers, everything. Beyond the house, the gravel road faded into a two-rut track and wound away through the Thousand Acre Wood. Toby Burton stood at the top of the hill looking down at the house, unsure and anxious. The classifieds had said one ten-speed bike was available, not twenty, but maybe the guy fixed them up and sold them? That didn’t make much sense, though, because the ad listed twenty bucks as the price. Who would put time and effort into fixing up a bike and sell it so cheap? Unless he got them even cheaper. Maybe he bought them from a junkyard for twenty bucks a truckload. The twenty-dollar bill in his front pocket was heavy on his mind. He’d stolen the money out of his mom’s purse that morning. If he left that second, he could slip it back into her purse without her knowing. But he wanted a bike. Needed a bike. Toby dithered at the top of the hill, and the temperature dropped with the sun. Anxiety scribbled across his face, he checked the time again. He wasn’t allowed to be out past dark, though it would be a rare thing for his mom to notice when he came home. Everyone else had a bike. He was the only one in his grade left taking it on the arches. His mom had the money, but she didn’t want to spend it on him. Not that she thought of Toby much anymore—he was old news. The only thing she had time for now was her new boyfriend. Randy. Randy the hitter. He needed a bike to get away from Randy. The house at the bottom of the hill looked okay. It was just a house, like any of the others on the street. Maybe in worse repair, but nothing too far out of the norm for the shitburg town he lived in. “Just do it, Toby,” he whispered, but still he dithered. He had to decide. If he didn’t leave immediately, there would be no way to make it home before dark. Not without the bike. “Do it, do it, do it,” he said to himself. He set off down the hill with a confidence he didn’t feel, his stride long and lanky, hands flopping loose at his sides. It wouldn’t hurt to check out the bike. See if it was as advertised. No charge for looking, right? The house looked bigger at the bottom of the hill. More imposing. Empty windows stared at him from the second story. The gate of the little white picket fence shrieked as he opened it, sending chills shivering down his spine. He mounted the rotting wooden steps to the porch, watching the windows. The house had an old-fashioned door bell—the kind you had to pull. With a glance over his shoulder, Toby reached out and pulled the lever. The door banged open. A tall, thin man stood in the shadowy interior beyond the door, looking at Toby with rheumy eyes. His white hair stood up around him in a gossamer halo. Food had stained the front of his shirt in multiple places. He wore an old pair of chinos and black work boots. “Ayuh,” the old man said, in a creaky, scratchy voice. He turned to leave, and a hand fell on his shoulder. He glanced at it sideways. The old man’s hand was inky-black and shriveled like the pictures of that mummy they’d seen in school. The bones of the man’s hand pressed against his skin and his skin was loose, drooping. His fingers ended in sharp claws. Toby’s mind yelled Run! as loud as it could, and he lurched in the man’s grasp and tried to bolt for the street. Toby looked at the man’s hand. It was back to normal, and he breathed a sigh of relief. Toby stood staring out at the empty street, the old man standing behind him in the way Toby imagined a father would. The longer he stood, the man’s warm hand resting on his shoulder, the less afraid he became. He grew more and more confident as the minutes ticked by. Toby glanced back at the growing shadows on the street. Going inside seemed to be a questionable idea. With a rueful grin, Toby turned and walked into the house. Start reading Demon King today!